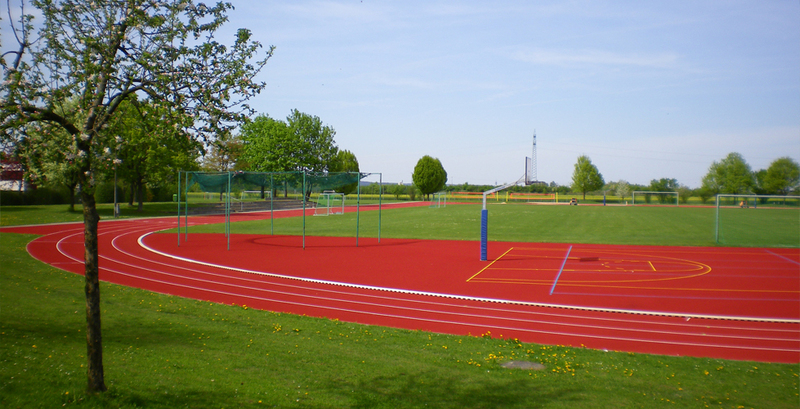 A very important element of new construction of modern sports and playground facilities are tested synthetic materials and layers. Therefore all arena synthetic sports coatings and layers are tested according to DIN V 18035-6:2004-10 and are audited and severely checked annually by others and ourselves. Arena sports flooring are build in with modern and up- to- date special machines by our own specialised staff on-site. 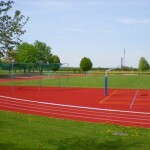 The unlimited area of application of our synthetic layers starts with the smallest school sports area up to the highest level of a competition area type A.
soccer, small area handball, basketball, volleyball, tennis, badmington, school sports areas, synthetic grass play grounds, leisure grounds courses as well as short distance courses and run-up courses. Mainly for playing areas for children, school or kindergarden areas, rehabilitation hospitals, senior homes, public swimming pools etc. To asure usage according to your needs it is useful to consult our experienced techniciens before you start your project. Further information about our sports layers you can find under our product details. Copyright © 2019 Arena Sportanlagen Service UG. Powered by WordPress. Theme: Accelerate by ThemeGrill.